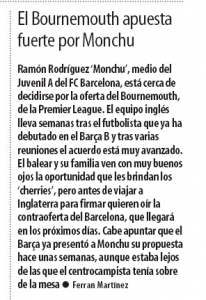 Mundo Deportivo report AFC Bournemouth are in the advanced stages of signing Barcelona Juvenil A midfielder Ramón Rodríguez Jiménez, commonly know as Monchu, this summer. The 18-year-old moved to the Catalan club’s youth setup from Mallorca in 2012. He has impressed for the Juvenil A side and his form for them saw the teenager get promoted to Barcelona B team in December 2017. According to the Catalan newspaper Mundo Deportivo, the Cherries have been closely following Monchu for several weeks. Bournemouth have held “several meetings” with the player’s camp and are close to reaching an agreement. Monchu and his family are aware of the offer made by Bournemouth. Before accepting their offer and flying to England, the player’s camp would like to know Barcelona’s last counter offer for the midfielder. The La Liga winners have already placed a proposal on the table for Monchu. 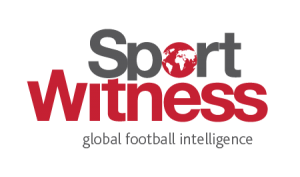 However, the deal is nowhere close to what is being offered by the Premier League outfit. Failure from Barcelona to give him an improved deal could see Bournemouth recruit Monchu this summer.